National Defense Minister Hulusi Akar on Friday visited the Turkish Task Force Command in Somali in the capital Mogadishu. 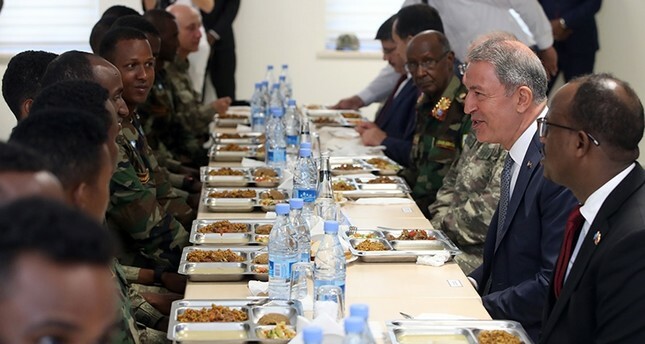 As part of his visit to the East African country, Akar and his delegation visited "African Eagles," the students who receive military training in the command. "Whatever we do for our brothers here is not enough. Our decision is to be with our Somali brothers and sisters not only today, but also tomorrow," he said. Akar and his delegation, including Chief of General Staff Gen. Yasar Güler, arrived in the country on Wednesday to hold bilateral relations and military talks. Akar also has visited Libya and Sudan for defense and security talks during his tour of the region. On Turkish counterterrorism efforts, Akar said: "More than 450 terrorists were neutralized over the last two months." He added that efforts in northern Syrian city of Manbij were ongoing and the joint Turkey-U.S. patrols were initiated as part of the agreed-upon road map and security principles. "At the end of this, all of the YPG will go east of Euphrates (River), the people of Manbij will take over the city…" Akar said.